Overall, this hotel was very nice, and clean. It was perfect for our romantic honeymoon getaway and the location was great. It was nearby to lots of eateries and entertainment places. We enjoyed our stay tremendously but were disappointed that the hotel staff did not offer us any special amenities since we were newlyweds. They respected the "Do Not Disturb" sign. They did not offer any complimentary amenities for newlyweds. Have stayed in this property last year. The room was much better this time around. The shower head in the previous room needed cleaning as the spray was inferior. This shower was excellent. The tub drained well too. I hate slow drains & standing in water while showering. Only cons were the hot water in the lobby for the tea, tasted like it had a taste of coffee. And the hall in the east side entrance smelled similar to the stuff they put in natural gas. Comfortable room with wireless internet. Property is well maintained. Good location. The hall way outside our room had an odor. But the room was ok.
Great place to stay and clean. Not enough lights to feel secure. The 147-room Courtyard by Marriott Westchase offers economically priced quality accommodation well suited to both the business and leisure traveler. Many of Houstons top companies are located within a three-mile radius of this three-story, non-smoking hotel. Those companies include Dow Chemical, Chevron, Shell Oil Products, National Oilwell Varco and BMC Software. The hotel has two meeting rooms for business or social functions. The larger can accommodate 45 guests. Area landmarks and attractions include the Great Southeast Equestrian Center, NASA Space Center, Houstons theater and museum districts, Minute Maid Park, home of the Houston Astros and Reliant Park, home of the Houston Texans. All the guestrooms, and six suites, have a work desk with high-speed Internet access, flat-screen television with cable movie and news channels, alarm clock, tea and coffee making facilities, iron and ironing board, pullout sofa bed, hairdryer and telephone with voicemail. Some rooms have a wet bar and refrigerator. The hotel has an outdoor heated swimming pool, whirlpool and a fitness center. The Courtyard Café is only open for breakfast but there several restaurants nearby including Chilis, a Hooters, Bennigans and an Outback Steakhouse. 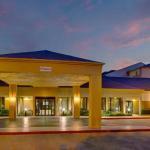 The 24-hour front desk has safe deposit boxes and information on area events and attractions. Other amenities include copy and fax services, a coin-operated laundry, vending machines, valet dry-cleaning and a picnic area with barbecue grill. This Courtyard has a lot of style, space and super service: That is the opinion of several former guests. The location, near many corporate offices, makes it a winner with businessmen. Accompanying wives were not unhappy. Shopping at Houstons noted Galleria was a short taxi ride away. Words of advice from former clients: The Courtyard is behind a Residence Inn and some cab drivers are not aware it is there. So ask for the Residence Inn, which most cab drivers know. Many guests are repeat customers at The Courtyard, which is a good recommendation.